HAVE TO DO WITH MORE THAN FOOD? What if the KEY to eating well was found somewhere other than what is on your plate? This free guide will walk you through 5 EASY principles that you can apply TODAY! These strategies will not only change how you eat, but how you LIVE! - How to dramatically improve your diet WITHOUT changing WHAT you eat. - 5 things you NEED to start doing that will make eating healthy SO much easier. - The ONE mindset that is stopping you from making progress in your health and fitness goals. Enter your email and you will receive your guide in just a minute. Then, in a few days you will receive a FREE Questionnaire & Workbook to walk you through the change process (and I'll be with you all they way!). You'll also be added to my mailing list where you can look forward to weekly encouragement for a healthier and happier life as well as hand-picked member exclusives. All with a faith-based approach! If you find it really HARD to change your diet? If you are always trying to "fix" what you eat only to end up frustrated, you are NOT alone! You are NOT a failure, it is simply time to take a DIFFERENT approach! 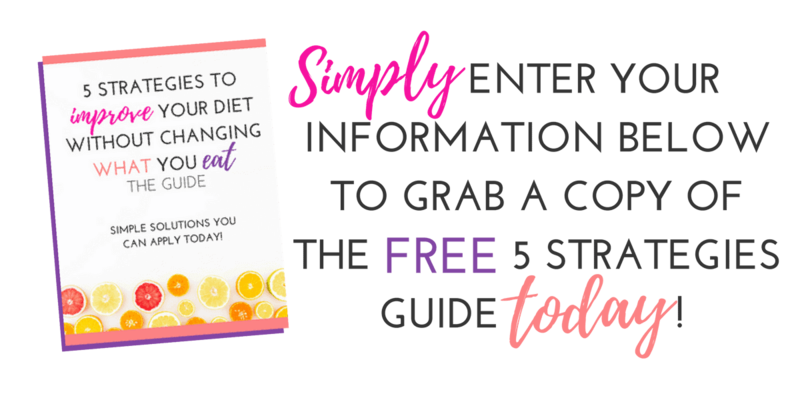 The "5 Strategies to Improve Your Diet Without Changing What You Eat Guide" will give you the practical suggestions and encouragement you NEED to move towards your goals! DON'T MISS IT! free guide delivered to your inbox right away! Today you will receive the guide and in a few days you will receive a FREE Questionnaire & Workbook to walk you through the change process (I'll be with you all they way!). Then you will be added to my mailing list where you can look forward to weekly encouragement for a healthier and happier life as well as hand-picked member exclusives and with a faith-based approach. Grace Filled Plate is a Christian-based health & fitness blog that will help you ditch diets, eat well, and let your light shine! This is a place where we focus less on a jeans size and more on living out our calling in life. We take good care of ourselves so that we can better serve others and live in such a way that others are saying, "I want what she has!". Visit GRACE FILLED PLATE to learn more!